How do HVO systems work? Q -- Is financing available? Q – Are the parts in the HVO System oxygen-rated? A – Yes. For safety and longevity, we use only oxygen-rated, oil-free parts. Q – How much oxygen fits in a tank? A – It depends on the size of the tank and the pressure. Our "Standard" compressor fills to 100 psi (6.9 bar), whereas the "Mighty Mite" and "MAX" compressors fill to 150 psi (10.34 bar). The main differences between the HVO proprietary tanks and commercial tanks are 1) HVO tanks are available in larger sizes, 2) HVO tanks go through a special process to ensure that they are OXYGEN CLEAN***, and 3) HVO tanks are powder-coated in our classic HVO green. ***WARNING: If you bought a used tank, beware that the presence of hydrocarbons such as oil or propane can cause your tank to EXPLODE when filled with oxygen. Keep in mind that the HVO System begins refilling the tank when the pressure goes below 30 PSI for the Standard and below 100 PSI for the Mighty Mite and MAX. The charts above show how much oxygen is available when the tank is at full pressure. Q – Is there a warranty? A – Full HVO Systems come with a 3-year warranty. New Respironics oxycons purchased through HVO are also covered by a 3-year warranty. The HVO 2-Go and AirSeps are covered by one year warranties. Q – What sort of electrical power do I need? A – The HVO Systems run on standard household power. A dedicated circuit is required for the Master and a separate dedicated circuit for the Relay Box. We sell 3-outlet (requires 20 amps) and 5-outlet (requires 30 amps) Relay Boxes. Q – How much does it cost in electricity to run the HVO System? A – It costs about $0.70 USD in electricity to generate the equivalent of a K-tank (based on Portland, Oregon kw rates). Use our calculator to get an estimate based on your specific requirements. Q -- How do I calculate the electrical usage of my HVO System in wattage? A -- Add the number of components in your system (ie, oxygen concentrators, HVO Master and Drones). Multiply that number by 550 for approximate wattage. For example, a 20 Mighty Mite and 3 M10s equals 4 components. 4 x 550 = 2,200 watts. For amperage, multiply each component by 5. In this example, 4 components x 5 amps = 20 amps. When calculating usage, keep in mind that the system runs about 50-60% of the time during the course of a work day. Use our calculator to get an estimate based on your specific requirements. Q -- What is the payback period on the HVO System? A -- The precise payback period depends on the cost of oxygen and electricity in your region, your usage, and the HVO configuration. Use our calculator to get an estimated payback period. Q -- Over a 3 year period, how much will I save using the HVO System instead of compressed or liquid oxygen? A -- Depending on your local oxygen costs, small shops can save around $7,000, large shops can save around $70,000. Use our calculator to get a three year Return-On-Investment estimate. Q -- How long can I run my compressor before it needs maintenance? A -- All compressors need to be serviced from time to time. Wear is inevitable due to compression, which causes friction and heat. High-powered, two-stage compressors may need to be serviced every two to three years, depending on usage. Small low-flow, low-pressure compressors need less frequent service. The HVO Standard compressor, for example, runs for a long time without the need for maintenance. When service is needed, customers will need to spend less than an hour and roughly $9 to replace a piston cup*. One customer ran an HVO Standard compressor for 4 years before they required service. In that time they saved more than $100,000 on oxygen, so it’s fair to say they were happy to pay a few dollars to fix their compressor. The Mighty Mite and the MAX have powerful, 2-stage compressors. Not only do they compress to 150 PSI, they maintain roughly the same compression rate throughout the cycle. This means that your concentrators are working at their full flow rate, even when they’re pushing against the back-pressure in the tank. The Mighty Mite is a custom 2-stage Thomas compressor. The MAX is a large 2-stage Gast compressor. *Unless the system is under warranty, in which case there is no cost. Q – Will the HVO System operate in a location that is not air-conditioned or heated? A – Our oxygen compression systems should be operated in an environment that maintains the temperature between 45 F (7.2 C) to 90 F (32.2 C), and the humidity at less than 50%. Plan to have good air-flow in the space where you system is located, which can be accomplished with fans and/or AC. Q -- I have a question not answered in the FAQ. Whom do I contact? When the system turns on for the first time, the tank pressure is at 0 PSI. This triggers the “charging” process. Charging consists of running the oxygen concentrators that are attached to the HVO system, compressing the generated oxygen, and storing it in an oxygen-clean tank. Tank pressure is monitored continuously. When the pressure reaches the high threshold (100 PSI for the Standard, 150 PSI for the Mighty Mite and MAX), the system goes into “discharging” mode, at which point the oxygen concentrators and the compressor are turned off. All that can be heard is the quiet hiss of oxygen running through the regulator. Once the pressure drops below the low threshold (30 PSI for the Standard, 100 PSI for the Mighty Mite and MAX), the charging process is triggered again. If the oxygen generating capacity is well-matched to the output requirements, you’ll receive a continuous supply of oxygen. The photo below shows a system that has all of the components in the HVO product line. Keep in mind that small systems don’t require a Drone or extra storage tanks. B: Drone Headbox: Augments the oxygen storage capacity. Is controlled by the Master. Note: Coaxial cables are used to send a control signal from the Master to the other controlled components (Drones, Relay Boxes). The system shown has ten Philips Respironics M10 (10-LPM) concentrators, yielding 100 LPM of oxygen or the equivalent of a K-tank per hour. The Master Headbox contains a proprietary circuit board that acts as the brain of the system. It may also contain the Seeing Eye™ IoT controller, which stores system metrics (e.g. PSI, purity) in the cloud. See below for more information. The Deluxe model contains an oxygen purity sensor and an LCD display on the front of the box. The LCD displays system status information such as current PSI and percent full. In addition, there are three LEDs: red for low oxygen purity, green for normal oxygen purity, and blue to indicate low tank pressure. Of course, every system contains a compressor that takes inbound oxygen and stores it in the tank. The compressor varies with the HVO model. See the post entitled ”How to choose the right HVO model”. The purpose of a Drone is to increase the number of oxygen concentrators that can be attached to a single system, as well as to increase the volume of oxygen that can be stored. The Drone lacks a controller. It is turned on and off by the Master via the coaxial control signal. Thus, you can’t use a Drone without a Master. The drone also contains a compressor that takes inbound oxygen and stores it in the tank. When there is overlap, consider whether growth is likely, i.e. whether you will add more oxygen concentrators in the future. HVO storage tanks are oxygen-rated, meaning that they are designed to store oxygen safely. The photo below shows a Master (left), Drone (center), and additional storage (right). The interconnection hoses are braided-steel lines (circled in red in the photo). 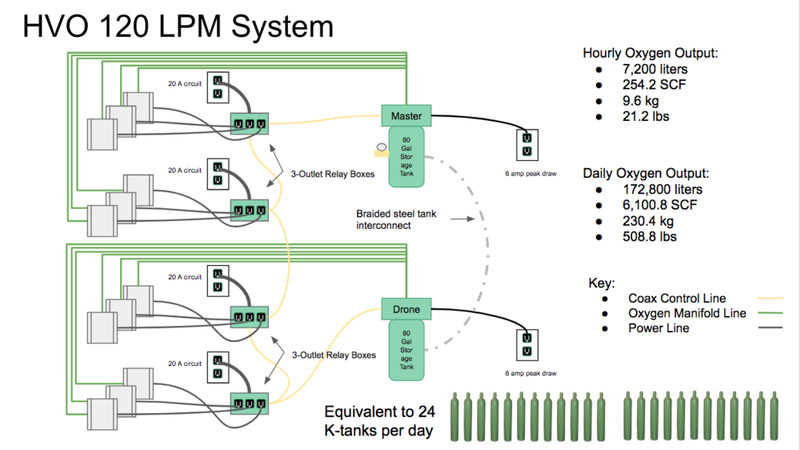 Together, the interconnected tanks form a single storage unit with a common tank pressure. Expansion is theoretically unlimited. 3-outlet Relay Box: Can power up to three oxygen concentrators. Requires a 20-amp dedicated circuit. 5-outlet Relay Box: Can power up to five oxygen concentrators. Requires a 30-amp dedicated circuit. When the master senses low pressure, it generates a 24 volt signal that is sent over the coaxial cable. Once the relay box receives the 24 volt signal, an internal relay switch turns on, causing the power outlets to become energized. There are two coaxial connectors per relay box so you can “daisy chain” the signal to additional components, such as a drone or another relay box. Four oxygen concentrators are needed, and at least a 30-gallon storage tank (see the Storage Tank section). This formula works best for Veterinary or Aquaculture Systems where the output is continuous. For torchwork systems, typical and peak usage vary. We are more than happy to make recommendations that will suit your usage and needs. Contact us with questions! * The oxygen flow in LPM that the system should be able to deliver continuously. Most oxygen regulators are designed for high-pressure tanks. The regulator below is the Harris Low-Pressure, High-Flow Oxygen Regulator. It is designed for the low pressure that is maintained in the HVO System. This is a critical component that will prevent oxygen flow issues. The cost is less than $200. The HVO Return on Investment Calculator provides an estimate of your HVO system’s power cost, but local power costs should be taken into account for accuracy. Small systems commonly cost less than $1 per day for power. IoT is simply computers incorporated into everyday devices, such as thermostats, refrigerators, doorknobs, and, now, HVO systems. The goal is to make these “things” more useful. What do these computers do? Mainly, they interact with sensors to gather actionable data and store it in a database in the cloud. HVO’s Seeing Eye™ IoT service is able to measure the pressure in the storage tank, the purity of generated oxygen, headbox temperature and humidity, as well as atmospheric pressure. See the graph below. A monitor process in the cloud examines the data to see if recent measurements are outside of normal ranges. When a problem is detected, the monitor process notifies a list of interested parties via text, email, or both. Enables customers and support personnel to know instantly about a problem with the oxygen supply, before it becomes a serious issue. Provides a historical record of oxygen availability and purity. Highlights system over- and underutilization. Tracks usage to indicate when a system upgrade may be needed, such as a drone, storage tank, or additional oxygen concentrators. The HVO Seeing Eye™ website has been certified by Qualsys SSL Labs as an A+ rated secure website. The HVO product line has three models known as the Standard, the Mighty Mite, and the MAX. In this post, you'll learn the difference between them and how to decide which one is best for your application. The Standard maintains tank pressure between 30 and 100 PSI. It can accept up to 45 LPM of input volume and requires a minimum input of 10 LPM. The Mighty Mite maintains tank pressure between 100 and 150 PSI. It can accept up to 45 LPM of input volume and requires a minimum input of 20 LPM. The MAX also keeps the tank pressure between 100 and 150 PSI. It can accept up to 55 LPM of input volume and requires a minimum of 40 LPM. The input volume is the combined gas volume produced by the oxygen concentrators connected to the HVO system. Oxygen concentrators typically produce 5, 8 or 10 LPM each. The concentrators we recommend using with HVO systems are 10 LPM, as they are more efficient with energy usage. What is the required oxygen flow rate? You should know the average flow rate you require in Liters per Minute (LPM). Take that number and add 5, then divide by the LPM output rating of the oxygen concentrators you plan to purchase and round up. Now you know the number of oxygen concentrators you’ll need. For example, if the flow rate needed is 20 LPM, add 5 to get 25 LPM. Divide by 10 LPM which yields 2.5 rounded up equals 3. You should buy (3) 10 LPM oxygen concentrators. How consistent is your oxygen usage throughout the day? For inconsistent usage (the typical case) you'll want a larger or extra storage tank and one or more extra oxygen concentrators to handle peak usage periods. If usage is consistent, you can use the number you calculated above. How likely is it that your overall oxygen usage will grow over time? If it's very likely, choose a system that has some "headroom", meaning you can add oxygen concentrators. For example, you may choose a 5-outlet relay box instead of the 3-outlet model. If there’s uncertainty, keep in mind that the HVO system is modular and expandable, so you can start small and add components as your requirements become better known. What is the output pressure requirement? If you are a veterinarian running oxygen cages, you probably need at least 50 PSI. This would eliminate the Standard as an option since the tank pressure with this model will go down to 30 PSI before starting to refill, whereas the restart pressure for the Mighty Mite and MAX is 100 PSI. Remember that the larger the tank size and the higher the maximum tank pressure, the more stored oxygen will be available to handle peak usage. You can see exactly how much oxygen is stored for the various pressures and tank sizes in the General Questions post. You need 15 LPM of sustainable flow and an output pressure of 30 PSI. Consumption doesn't vary much throughout the workday. In this case, an HVO Standard 20 gallon system (or HVO 2-Go) with two 10 LPM oxygen concentrators will satisfy your immediate requirements. You need 30 LPM of sustainable flow most of the time, with occasional peak usage of 50 LPM. In this case, a Mighty Mite 60 gallon system with three 10 LPM oxygen concentrators will be a good fit. The higher pressure of the Mighty Mite, as well as the larger storage tank, will allow more oxygen to be stored to handle peak usage periods. You need 50 LPM of sustainable flow with peak usage of 80 LPM. The MAX will be your best choice here, as you'll be able to attach six 10 LPM oxygen concentrators. Another way to grow an HVO system is by adding drones and/or storage tanks. For more information, see the post “How to expand your HVO system”. If you find that your oxygen requirements have grown since your original purchase or you’re thinking about buying a large HVO system, this post will be helpful. Did you know that HVO has the only expandable oxygen-generating system on the market? This means that you can start with a system that has one oxygen concentrator generating 10 LPM and add capacity to generate 80, 100, 120 LPM, or even more. Because of this, you can preserve your original investment, making the Total Cost of Ownership (TCO) for an HVO system lower than any competing product on the market today. The least costly option is to add concentrators. However, there is a limit to how much input volume each product can handle. For the Standard and Mighty Mite, you can attach up to five 10 LPM oxygen concentrators, whereas the MAX can handle six. If an existing system has fewer than the maximum number of oxygen concentrators, you can add one or more to increase your HVO system’s overall oxygen-generating capacity. If your system already has the maximum number of oxygen concentrators attached, the next option is to add a Drone. A Drone is a compressor that sits atop its own storage tank allowing you to add additional oxygen concentrators. The Master storage tank is connected to the Drone’s tank via a braided-steel interconnect line that essentially turns two tanks into one big tank. The Drone is turned on and off by the Master via the same coaxial control line that turns the oxygen concentrators on and off. With a Drone, you get to add both oxygen concentrators and oxygen storage, greatly increasing the overall generating capacity of your system. Drones are available with 60- and 80-gallon tanks. You can add multiple drones, for very large systems. If you have peak usage intervals and long periods of low usage, you may be a good candidate for this second-to-lowest-cost option. Adding a storage tank may make it possible to generate and store enough oxygen to perform certain time-bound tasks. In this scenario, you’ll have predetermined the amount of oxygen needed. With the proper-sized storage tank, enough stored oxygen will be available to get the job done. You can always add a Drone headbox to the storage tank at a later date. This article only pertains to customers who are using the Seeing Eye Cloud Service. Most of our customers use a WiFi connection to get IoT data up to the cloud, but you can use an Ethernet cable. This is a great option when it’s easy to run a cable to the HVO system. A hard-wired connection will provide higher bandwidth, better latency, and greater reliability. Turn off the HVO system using the black switch in the back of the headbox, and unplug it, as well. Run an Ethernet cable to the HVO system (cat5 or cat6 will work). Remove the three Phillips-head screws from the headbox lid (the box on top of the tank) and open the lid. NOTE: Do not reach into the headbox with metal tools. Also, be careful not to disturb the red/green/black wires on top of the IoT controller. Snake the Ethernet cable up through the large center hole at the bottom of the headbox. Find the IoT controller. It's a black box with an LED matrix on top. Find the Ethernet jack on the IoT controller (near the USB ports) and plug it in. Close the lid, button up the screws, and turn on the system. At the end of this procedure, you may have two network connections (if WiFi had been configured prior to this change) and an IP address for each. The IoT controller will choose the best network connection, which will nearly always be the wired connection. Symptom: The system is not turning on or some components are turning on but others are not. IMPORTANT: Pay special attention to #1 below. YOU MAY NOT HAVE A PROBLEM AT ALL. It’s worth checking. Is the system off because the pressure in the tank is above the low setpoint? What is the tank pressure right now? If the pressure is above the low setpoint (greater than 30 PSI for the Standard, greater than 100 PSI for the Mighty Mite and MAX), the compressor will NOT turn on until the pressure falls BELOW the low setpoint. This is a safety mechanism that prevents the compressor from straining against high tank pressure during startup. In this case, use oxygen. Eventually the pressure will drop below the low setpoint and the system will turn on. Is the system plugged in and powered on? Check the circuit breaker panel for tripped breakers. Recent models (since October 2018) have a green LED on the circuit board. To see it, you must open the lid of the headbox. If the LED is lit, the headbox has power. Are the oxygen concentrators getting power? Read on. Are the coaxial cables attached to the right components and hand-tightened? There should be a coaxial cable running from the headbox to the relay box. If you have multiple relay boxes, you can daisy-chain the signal from one relay box to the next using the second coaxial connector. If you have a drone, you’ll also need a cable running from a relay box to the drone’s coaxial connector. NOTE: The coaxial cable(s) should only be hand-tightened, but firmly attached. You can use a wrench but be very gentle — over-tightening can strip the threads. If tightening doesn’t help, you may want to try a new coaxial cable. Do you have sufficient power? Each headbox (Master and Drone) requires a dedicated 15 amp circuit. Each 3-relay box requires a dedicated 20 amp circuit. Each 5-relay box requires a dedicated 30 amp circuit. If the circuits are not dedicated, other non-HVO devices may be using power and reducing the available amperage. Are the brass manifold connectors seated correctly and hand-tightened? Poorly seated fittings can allow air to be drawn in which can dilute the purity of stored oxygen. Are all of your oxygen concentrators turned on? Check the power switch on each concentrator. Look for warning lights. Check your circuit breaker panel for tripped breakers. Are there any line leaks? Check all oxygen line fittings (barbed fittings, push-to-connect fittings, manifold plugs) to ensure that they are firmly connected. 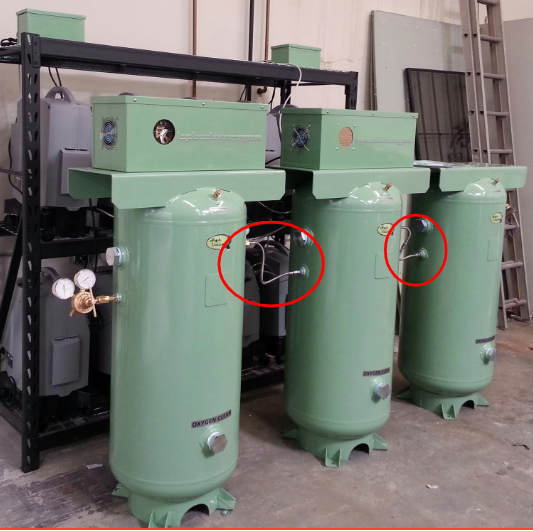 Gently check to see that the brass fittings are seated correctly on the barbs of the oxygen concentrators. Photos of the inside of the Master headbox. You must remove the three Phillips-head screws from the lid. Open the lid and take 2-3 pictures of the inside of the headbox. We need to see the logic board, compressor assembly, and compressor dump-valve. If there are other photos that may be useful, please take those, as well. DANGER: Do not reach into the headbox when the system is plugged into live power. Any notes about what you’ve tried. Be sure to go through the Diagnostic Procedure below BEFORE contacting us. A subject line that states “HVO ISSUE at <your business>”. Your name, phone number, and the time that the problem was first observed. If there were any recent events that may be relevant (lightning storm, power outage) please mention these, as well. For urgent issues, you may text +1 (402) 990-6143. An urgent issue is defined as an HVO-related problem that is causing a significant loss of productivity or an outage. We do not provide 24x7 support, but we will go out of our way to help you as quickly as possible. Check for tripped circuit breakers. Check that every outlet that you are using works properly. To test, plug a working tool like a hand drill or a lamp into each outlet. If you have a voltmeter, you can use that. Check the connections to all your coaxial cables. If the cables seem worn or have an intermittent connection, replace with new coax cables. When the system is running use a voltmeter to see if 24v DC power is running through the cable. If you don’t have a voltmeter, you may want to visit the hardware store and get a cheap one. It’s important to have one for quick problem solving, and it can be difficult to solve tricky problems without one. Check the oxygen concentrators. Unplug the concentrator from the relay box and unscrew the brass fitting to the manifold. One at a time, plug the concentrator directly into a working wall outlet (you can use an extension cord for this). Check oxygen flow using the flow meter on the oxygen concentrator. This assumes that you have a flow meter. If you don’t, you may want to invest in one. Verify that each of the concentrators is producing an adequate flow of oxygen. Does the lpm rise or fall as you turn the knob on the flowmeter? Verify relay box power. One at a time, test each relay box separately by running a (tested, known-to-be-working) coax cable directly from the master to one relay box at a time and turn on the master. Note that the tank pressure must be below the low setpoint for this to work. If necessary, release some oxygen from the tank so that the master turns on. Check the dump valve assembly. If the compressor is running and you can feel air coming out of the clear line under the headbox, this means that the dump valve isn’t closing. A new dump valve may be needed. Test the Drone. Run a working coax cable directly from the master to the drone. Make sure the drone switch is in the “on” position, the cable is fully tightened, and the cord is snug in the back. Plug the drone directly into a free outlet separate from the master. Disconnect the oxygen inlet hose on the back of the drone and check for a vacuum. Listen to determine if the drone compressor is coming on. If it’s humming but not coming on (no vacuum) turn it off immediately and call service. When you reconnect the system, check all cords, cables, and connections. Power cords and cables can come loose over time from vibration. Coax cables can jam and seem fully tightened when they’re still loose. Wiggle the screw connector and keep trying to move the nut until it is tight (tighten only by hand). Eliminate non-functional components. Pull out any non-functional concentrators and/or relay boxes. You can often assemble a temporary system with the working components while others are being serviced. WARNING: Never operate the HVO system with the oxygen concentrators powered off but still connected to the manifold unless the flow valves are turned all the way to zero. Running atmospheric air through concentrators that are powered off could cause permanent damage to the sieve beds. The best practice is to disconnect the oxygen line from each non-functional concentrator and plug the hole in the manifold where they were removed. Sometimes a lightning strike can cause blown circuits. The HVO circuits should reset but some concentrators have external pop off fuses that need to be reset. Insufficient ventilation of heat and / or nitrogen. Nitrogen build-up will cause low oxygen purity in a closed space as the available o2 in the air is depleted. The cure is to install additional ventilation. You can plug a fan into an available outlet on the relay box to circulate air when the system turns on. Ambient temperature is above or below what is recommended for PSA oxygen concentrators. Practically all models operate best between 45 - 100℉, with humidity below 50%. Flow meters should be dialed to just below the top flow rate. For example, a 10 lpm oxygen concentrator should be dialed back to 9-9.5 lpm. Leak in the manifold. Check all the oxygen lines. Check that the brass fitting is securely seated on the barb of the oxygen concentrator. Hand tighten fittings, do not use tools on the brass fittings connected to the barbs of the oxygen concentrators. Check the manifold lines at the push to connect fittings. If necessary, cut off the ends of the lines to make a flush cut, and re-insert into push to connect manifold or connection. Some concentrators, such as Integra Sequel, occasionally don’t turn back on even though the relay box is calling for power. Plug your concentrator directly into the wall and turn it on. Disconnect power cord, wait 10 seconds and plug it back in. If the concentrator does not power back on, it may not work well with the HVO System. Note that a non-functioning Drone can be temporarily left in place. Disconnect the oxygen input hose in the back and make sure all the o2 being generated is attached to the master or other working drones. Here’s a video that takes you through the battery removal procedure. Use the following tables as you work with your electrician to determine the power needed for your system. This guide will help you setup your HVO system. The instructions apply to the Standard, Mighty Mite, and MAX products for configurations with one oxygen storage tank and one relay box. Watch this video to learn how to clean and change the filters on your Millenium M10 oxygen concentrators.